Here's a link to share with friends. Copy & Paste! Inner bevel is hand cut to a 45 degree angle with outer "contact zone" being gently eased by hand sanding. 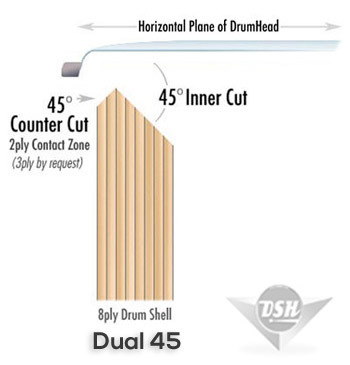 The small 1ply head to shell contact zone lets the head sing, which allows for very easy tuning. Best for thinner 6ply shells. Inner and outer bevels are hand cut to a 45 degree angles. 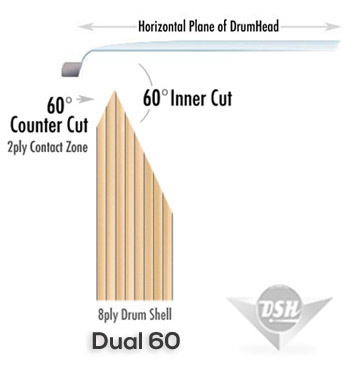 The greater 2-3ply head to shell contact zone allows for a little more tonality from the shell, with controlled volume. Not available on thin 6ply shells. 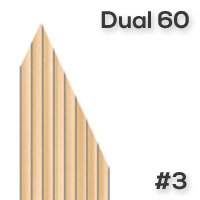 Inner bevel is hand cut to a 30 degree angle with outer "contact zone" bevel cut to a small radius roundover. The large head to shell contact zone gives the most body possible, with minimal attack, sustain and volume. 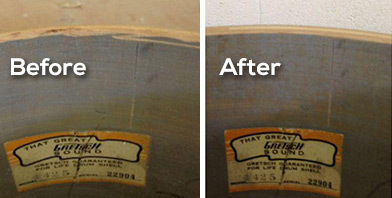 Fans of vintage drum tone will love this edge. Hoops and heads removed from your shells. Any ply openings or cracks filled & made solid. Any loose wrap near edge glued down solid. Any extreme dents made flat and level. 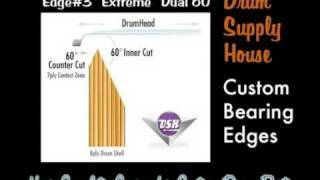 Need us to make your shells ready for new edges? 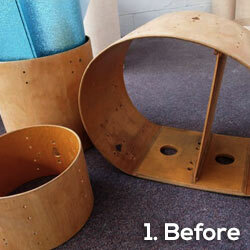 Pro take-apart, ply filling, leveling, wrap seam repairing of your shells is $45 per hour. 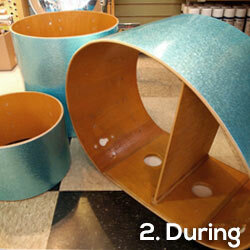 Please call us at 800-NEW-DRUM for estimate. 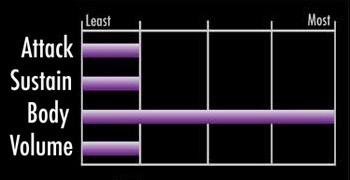 NOTE: Prices below are for ONE edge recut. 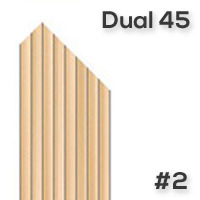 If you need BOTH edges re-cut, choose quatity TWO. ADD +30% for Acrylic Shells. 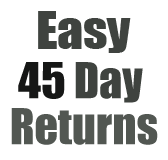 After we see your order, we will contact with details of shipping your ready shells into our shop. 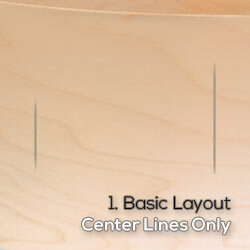 Basic layout for standard parts on a wood drum. SIMPLE CENTER LINES MARKED ONLY. 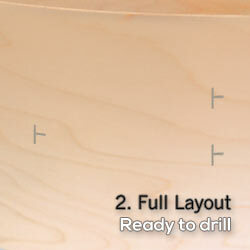 NO DRILLING INCLUDED. You can place the final marks your chosen parts and drill from there. Save $$$ by doing most of the work yourself. Please give us notes of any needed details about your project in the order comments box during checkout. Shells & parts are NOT included in this cost. Layout for OFFSET lugs and extra air vents is available for an additional cost. We can also work with YOUR SUPPLIED parts by request for an additional cost. Full layout for standard parts on a wood drum, using parts that we stock. NO DRILLING INCLUDED. COMPLETE CROSS MARKINGS ONLY. Ready for you to drill to our precise markings. Save $$ by doing some of the work yourself. 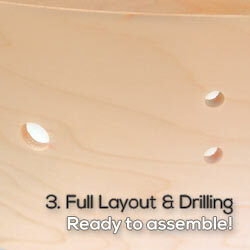 Complete layout & drilling for standard parts on a wood drum, using parts that we stock. ALL DRILLING INCLUDED. 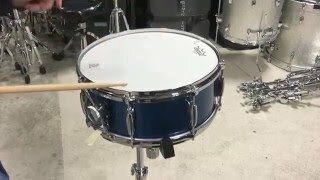 Makes a super easy job for you, just bolt on your parts and tune up your new drum! Please give us notes of any special details about your project in the order comments box during checkout. 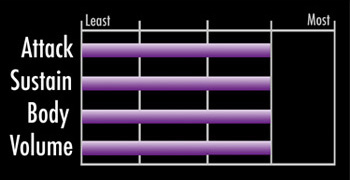 NOTE: For Glass Glitter material +10% will be added, due to extra care and time required. Applying new wrap to the shell with 100% glue coverage. 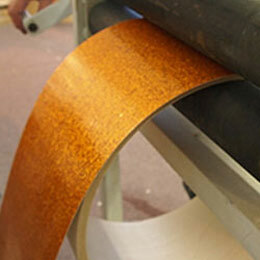 Bonding surface and seam with our high pressure rollers. Hand blending the wrap into the outer bearing edges. Removing drum badge and/or air vent grommet. Re-drilling any needed holes through wrap for hardware. Reinstalling badge and/or air vent grommet. All hardware removed from your shells. All old drum wrap stripped from your shells. 100% of old glue/tape residue removed from shells. Any high or low areas made smooth and level. Any holes that you DO NOT want re-drilled tape over from inside. Need us to make your shells ready for wrapping? Professional stripping, prepping, repairing of your shells is $45 per hour. 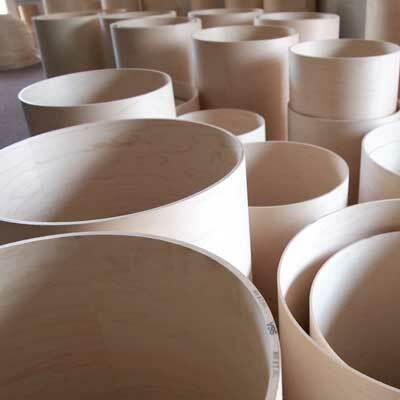 Please call us at 800-NEW-DRUM to discuss your project details for an estimate. 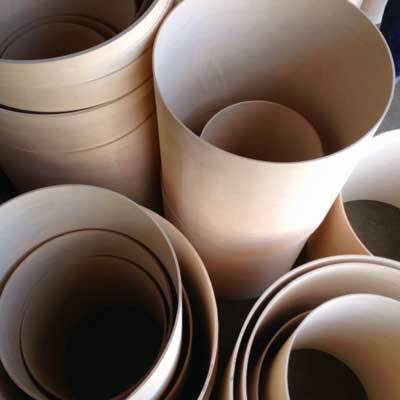 The wrap material is purchased separately here. Bearing edge re-cutting service is available separately here. 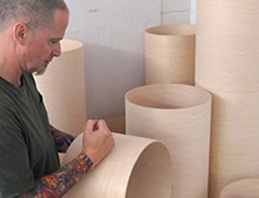 Since 2005, Rob Kampa has been the hidden talent behind the DrumMaker in-house custom shop. Rob has experience as a research scientist, science teacher, a drummer/instructor and a fine furniture refinisher. He spent a decade of his life working in the field of chemical research and has even taught science. So when it comes to applying scientific method and the principles of materials science, Rob holds valuable knowledge of the critcal underlying factors of wood crafting, finishing, and the physics of sound... basically he knows how to build a great drum. For some in the drum industry, Rob has "flown under the radar". Having crafted 3000+ snare drums, he is truly an innovative and influential custom drum maker. He has crafted drums for the likes of Blue Man Group, the U.S. Army Ground Forces Jazz Bands, and many metal and country artists. For more than 24 years, Rob has challenged drum making communities around the world to raise the level of excellence. In 1989, When Rob brought his own "Magstar Drums" onto the scene, there were only a few fledgling custom drum makers searching for new ways of approaching the individualized needs of drummers. Many knew the look and sound they wanted, but couldn't find it amongst the cookie cutter brand-name drum co's of the time. More than a decade before the modern-anything-you-want custom style was born, Rob had begun to experiment with different materials and techniques of bearing edge cutting, wood type and ply-configurations to produce drums with higher sensitivity, projection and response. 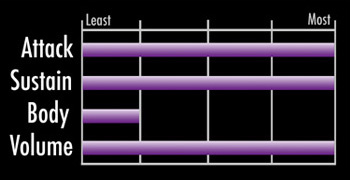 Magstar first appeared in Modern Drummer magazine's New and Notable section in 1993. Proving that by utilizing the right tools and craftsmanship, one could embark upon a mission to give the big name drum companies a run for it. The custom drum world was still in very early days and Rob Kampa was one of only a select few paving the way for the craft we know today. 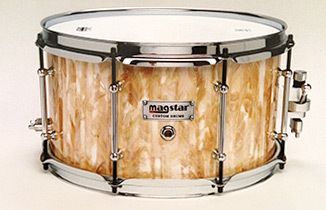 By 1994 Magstar's snare drums were under full review, showing up in MD. A full kit review followed in 1995. This Magstar kit utilized low mass piccolo-type lugs on the toms and bass drum which were powder coated for visual effect and low-maintenance. Both features uncommon before this time. December 1997, brought another great MD review of Magstar snares. Rob's innovations were soon to inspire be imitated industrywide. 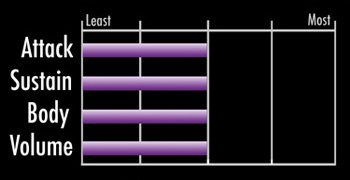 Altogether, Magstar has seen 5 very favorable major reviews in Modern Drummer magazine. "If you have ever had the chance to play one of Rob's creations, you know that he knows how to build a great sounding drum." In the DrumMaker shop today, Rob is ready to hand craft your drums to any stage of completion, whether it's just prepping your raw shell, re-cutting edges on that vintage snare or creating a full custom kit with multiple steps of hand sanding, custom bearing edges, drilling mounting holes, shaping snare beds, and wrapping with plastic finishes. He maintains his fanatical devotion to the craft of drum making. 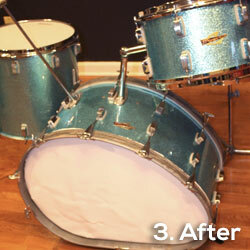 From 1995 to 2004 DrumMaker custom work was done by Bill Von Kamp of Huntsville, AL. 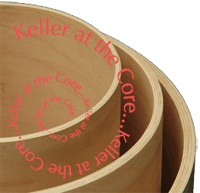 Bill was a true craftsman from the old school of drum building, having spent time perfecting his craft at the Corder drum company. After many years in the industry, he was anxious to retire. Many of the original tools, jigs and templates that Bill acquired from the Corder and Fibes drum companies are still utilized by DrumMaker in our shop today. 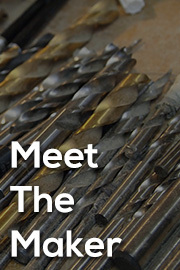 A few include: Our 42" custom belt-drive sanding disk for trueing shells, a special table saw jig for cutting shells to depth, and our high pressure roller used in applying wrap. 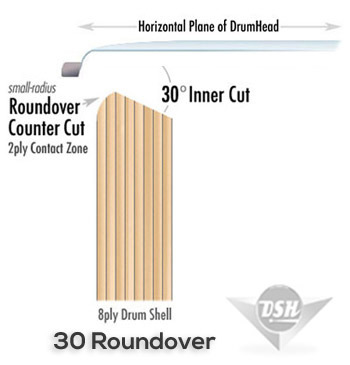 Tools like these combined with our seven router stations allow DrumMaker to offer nearly any imaginable bearing edge design/profile. Bill has likely forgotten more about the art of drum building that most of us will ever come to know. 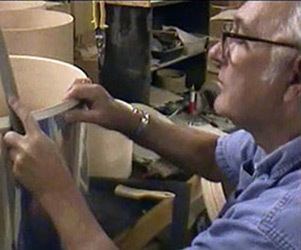 He passed the torch along to Rob Kampa, sharing his drum makings secrets and techniques during an in-depth crash course visit to his shop in 2005. 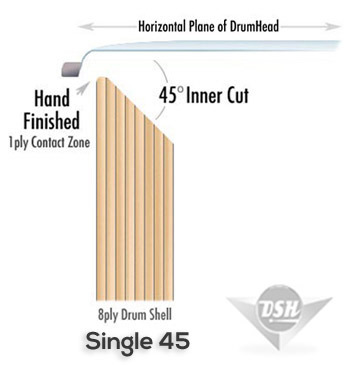 Rob has combined this old school art of handcrafting and attention to detail with the his own cutting edge and scientific methods to offer DrumMaker builders the best of all worlds. 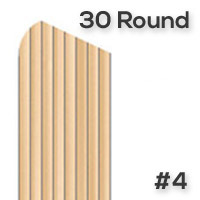 thickness .166" or 4mm or 5/32"
*NOTE: Double cut edges are not available on thin 6ply shells. 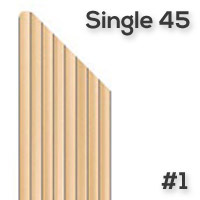 Only Edge #1 - Single 45 can be cut on such a thin shell wall. thickness .220" or 5mm or 3/16"
* Note: 2019 prices posting soon. 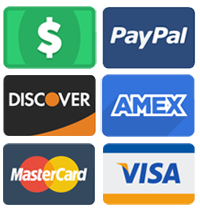 Add shell to cart to see current cost.